"Fastest Facebook™" is a handy and reliable Firefox extension designed to implement a sidebar to easily access facebook.com. With Fastest Facebook, you will be able to enjoy the social experience while browsing other pages. Please Note that this Addon is not officially affiliated with Facebook or any Facebook products. Fastest Facebook is a handy and reliable method to access mobile version of facebook.com in your Firefox sidebar or Chrome panel. How can I open the sidebar in Firefox browser? You can access Fastest Facebook sidebar by either using "ALT + X" short-key or pressing the toolbar button. Note: by default the toolbar button is invisible. You can insert it into your toolbar through right-click context-menu. Select "Customize..." and then drag and drop the button to a proper position. How to uninstall Fastest Facebook extension from your Firefox? 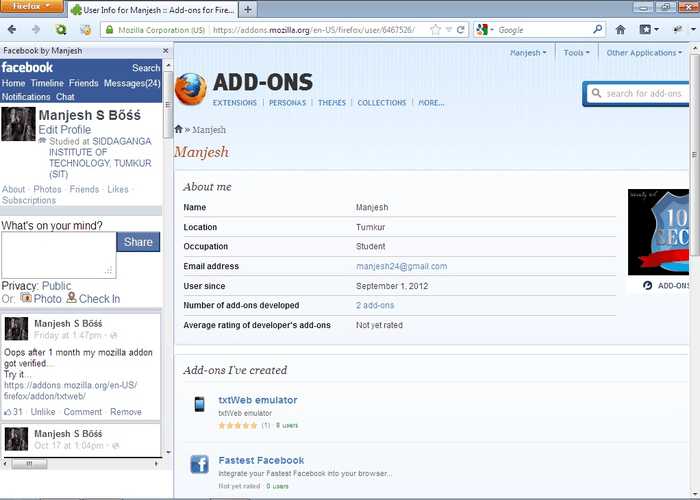 To uninstall the extension go to Firefox -> Add-ons -> Fastest Facebook, then press Uninstall button.